Embracing life in the slow lane. Left or right? I let Freya decide. We often take the path less travelled – even if it leads to nowhere. We stop and watch frogs “cuddling”. We pet friendly dogs. We scratch stray cats. From conversations with strangers we have learned about the importance of yellow birthday scooters (no pink allowed), how to make frothy milk with a whisk and the torment that is left after the suicide of a beloved son. We make daisy chains (badly), spot planes, count bees. We have time to notice things; the shiny sticker lost on a path, the first butterfly of the year or the squirrel attempting to carry too many nuts up a tree. I love this pace during the odd free hours I get to spend with her but I know, even a year ago, I would have found it … excruciating. Walking was about getting somewhere – and you needed to be quick if you wanted to keep up with me. I saw no point in dilly dallying whether I was going to a job, the shops or even when supposed to be enjoying a leisurely stroll around a local beauty spot. If the pace wasn’t world record level it was certainly very close to it. For me it was about getting to where I needed to be. Fast. Now a walk often takes twice as long as it should – and sometimes we don’t even get to where we are supposed to be going. It has taken some time to get to this point, to realise that the philosophers and poets are right and that the journey is as important as the destination. And it is Freya that has led me. Sometimes I feel like I’m teaching her and then every so often I will think: “Oh, hang on. Surely this is the meaning of ‘stop and smell the roses'”. Often literally. Toddlers have such a fascination for everything. Everything needs to be looked at and poked if mummy will let her, which quite often, now, I do (I’m a bit less trigger happy with the wet wipes these days too). Our plans are fluid. There is no concept of time. I don’t even wear a watch anymore. She takes my hand and off we go. And, I have to say, I’m very much enjoying the ride. Previous postReview: Choc Chicos (Cheeky Chocolate Kit For Kids). Next postMy Sunday Photo – week 26. How lovely! I need to take a leaf out of your book, I charge around on a mission most of the time. So hard to forget that sometimes you just need to simply be. Wow! This morning’s blog reading is making me very reflective – must be something in the air! I imagine it’s MUCH easier with just one little person to worry about but I do find even an hour or with no particular plan is a lot of fun. A list of all the things I have waiting to do is still in the back of my mind but I put them aside for that time (mostly, anyway) 🙂 I hope you have a good day. Thank you, Lisa. I have to say we do have some days where we are rushing about but I do try and enjoy this easy time with her. No doubt as she gets older she’ll need more to hold her attention. I know, right! I would LOVE a nap right now. Hehe! How great would a nap be?! AMAZING!! Thank you! I’m not always so laid back but I do make sure to try and enjoy the free time we have. How are you? You’ve taken some gorgeous photos of your girls recently. I sometimes forget that my Boy is all growed up. When we go for a walk I still look around for things to point out to him. Even when he isn’t there. Found it, sorry it was in spam for some reason. Aww I kind of like that in a way. It’s like he’s with you even when he’s not thanks to nature. It seems so obvious but it was a real revelation to me when it dawned on me that it is your children who teach you how to parent. It shines through this that Freya is the teacher in this scenario, and the beauty of it is that you are allowing yourself to learn. I still rely on my 14 and 20 year olds to give me the clues I need to parent them. Thanks, Caz. I dread to think what she’ll be like at 14. She’s already so bossy now. Hehe. 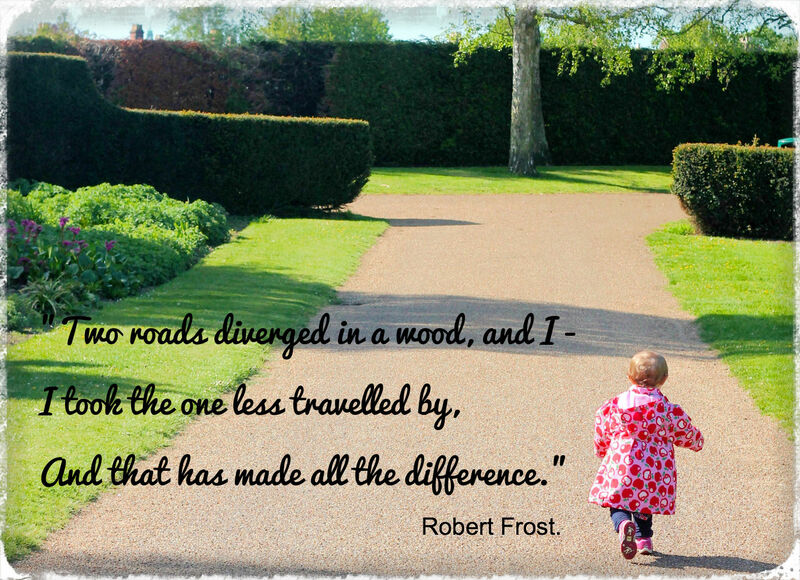 ‘path less travelled’ – more than often leads you on some great adventures, and adventures as a child is what its all about! 🙂 Have fun! I thought I left a reply here. Obviously, it only happened in my imagination. Obviously it was observant, witty and totally relevant to your post. Hah, thank you for the thought anyway. I’ll check the spam filter, just in case.